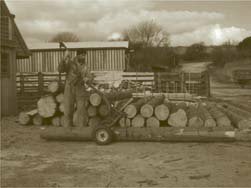 With a simple ‘Cam action’ a whole 16ft x 12" log can be lifted up onto two wheels and then pushed, or pulled where desired by hand. 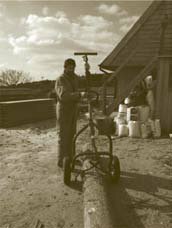 Whether you are moving sawlogs in a wood, manoeuvring beams or heavy timbers in a yard the ‘logging arch’ will save you the strain and quickly become indispensable. 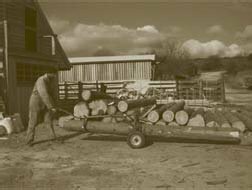 Two sizes are available: a small one (the Mule) as pictured for logs up to 12” diameter and up to 16ft long, and a large version (the Ox) that can take logs of up to 26" diameter and 16ft in length for towing behind an ATV, tractor, or other vehicle. It can also be used in combination with a winch. 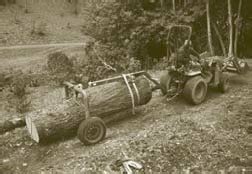 (3) Log is then balanced, up off the ground and on two wheels and can then be moved to where you like! Newer PostGreek Hardwood Utilisation: What techniques could be transferred to UK markets?